This review first appeared first appeared on Ottertooth under Temagami reviews. Kevin Callan has written his sixth canoe-route guidebook. Not a cut-and-dried Frommer's Does Ontario by Canoe guidebook. No, this one has got attitude, the same attitude that have made his books so popular. 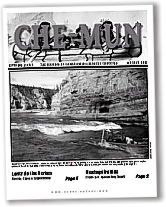 Ontario's Lost Canoe Routes contains 15 Ontario routes, three of which are in the Temagami region: Chiniguchi (chih-nih-GOO-chee) River, Thunderhead-Bob lakes and Marten River Park. These Temagami routes are not as well known and, particularly in the case of the Thunderhead route, not well used. His goal for this book was to find and publish out-of-the-way routes before they are lost. Those who write up canoe routes have been criticized by some canoeists who see them opening up their private utopia. But I disagree with them because, sadly, reality is a harsh teacher. Kevin's route books are fun to read and he doesn't gloss over his own misfortunes or mistakes, often with self-deprecating humour. On his Chiniguchi trip, he dropped his canoe on a portage and soaked his first-aid kit. To bandage a cut he "had to resort to holding a piece of gauze over the cut with a strip of duct tape." Ouch. There are a few minor factual errors in his research of some Temagami features. He attributed the Wakimika Triangle old-growth trails to Friends of Temagami, when they were built by Temagami Wilderness Society and Earthroots. This book will help gain recognition for the 15 routes and provide some great choices off the beaten path. Even if you aren't intending to put your paddle in the water any time soon, the stories of his travels are so interesting that you will probably change your mind. Wilderness Bound is a small outfitting business in Hamilton, Ontario with some big multimedia capabilities. Run by veteran guides, George Drought and Barbara Burton, Wilderness Bound not only runs exotic trips in the far north, they also publish superb river guides and have two video productions on a pair of the north’s most famous rivers, the Back and the seldom-travelled Hood. Now while these are amateur productions, they take good advantage of the great leaps in technology lately. And talk about synergies, the videos were shot while leading groups of paddlers down these remote rivers. No doubt these videos serve them well to attract new customers who will be impressed by their style — a non-macho, group participation effort with an emphasis on history. And like the ground they sleep on, the videos are a little uneven but very watchable and nicely convey the feel and realities of a northern canoe trip. Though you certainly would like to have a bit more info about the river and more about the trip participants who provide most of the narrative.